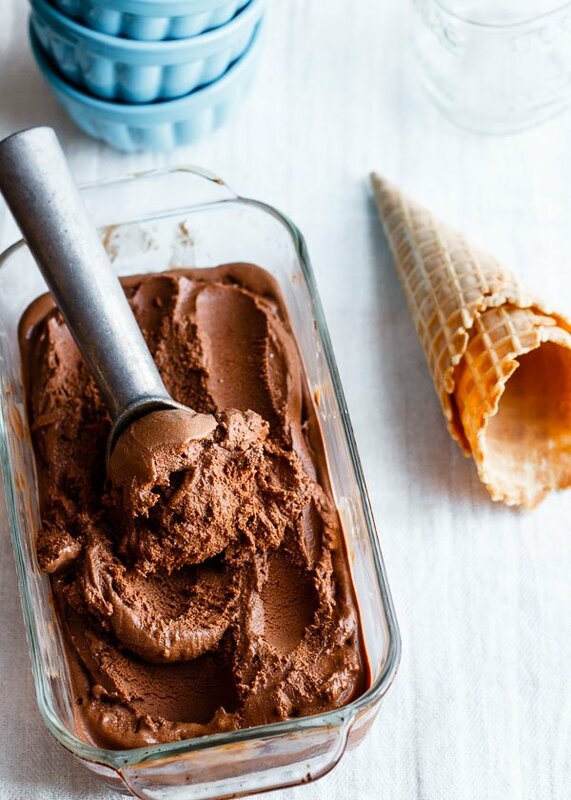 Extraordinarily fudgy ice cream that’s gooey, intensely chocolaty, and date sweetened (surprise!). 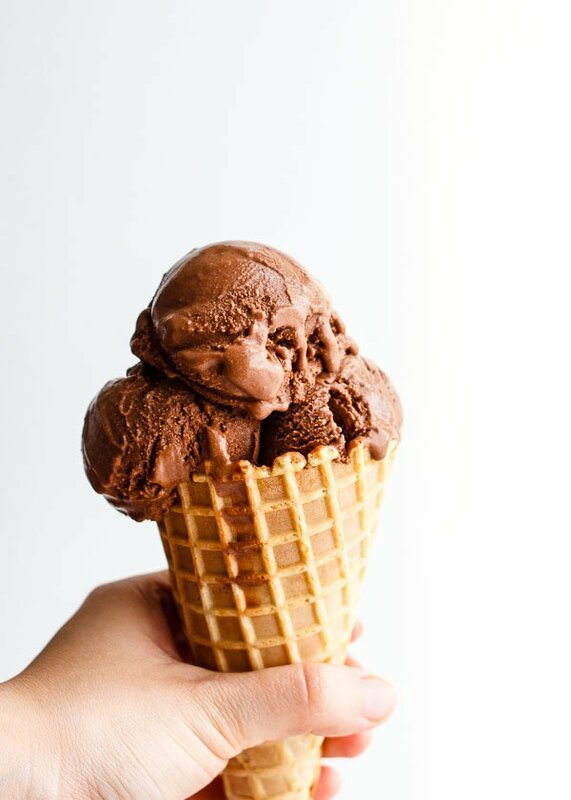 Inspired by Coop’s MicroCreamery’s OMFG Chocolate Ice Cream (named one of Boston’s best pints! ), my riff tastes so similar Mark said if I had put it in a Coop’s tub in his freezer, he wouldn’t have known the difference. Forgive me for the framing up above. This blog is a one girl show. It’s like that cartoon where T-Rex says “I have a big head and leetle arms.” That’s me. Between holding a giant ice cream cone in one hand and reaching for the shutter button with the other, it’s a miracle my cone didn’t go flying. Dates are full of sugar, but they’re also full of fiber, which cancels out some of the sugar in my opinion (there’s some real science behind this!). 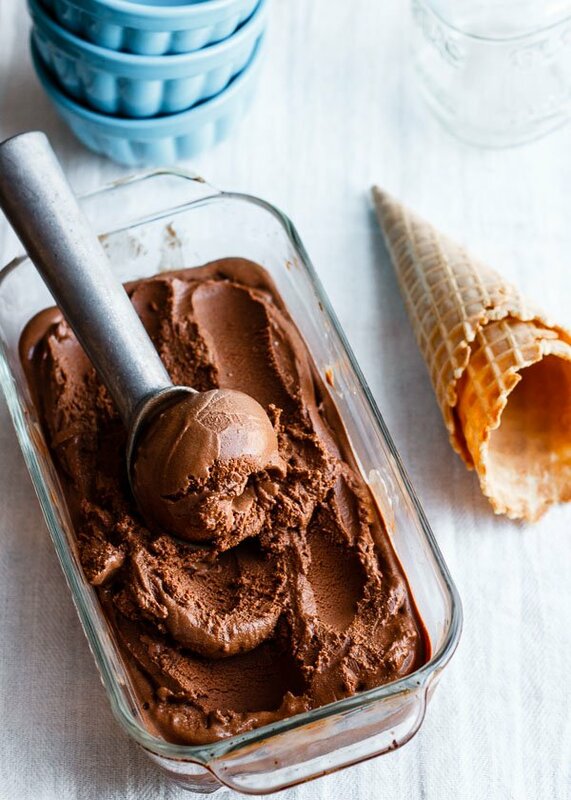 The date puree also adds incredible body to this ice cream, so there’s no need for other thickeners like egg yolks or cornstarch. Yay. Keeping it simple. If you don't have Kahlúa, you can brew half a tablespoon of coffee in the simmering milk before adding anything else. Just strain the coffee grounds out and return the milk to the pot. Then add 2 and 1/2 teaspoons rum plus 1/2 a teaspoon of pure vanilla extract in place of the Kahlúa before churning. In hot temperatures, placing a lid or plate over the opening of your ice cream maker while it's churning helps trap in the cold air. This won't work with the KitchenAid attachment but works well with Cuisinart models. Pour boiling water over the Medjool dates and let them soak for a few minutes until the skin starts to peel. Drain, rinse under cold water, and peel the dates. The skin should slip right off. If they don't, you need to soak the dates for a little longer. Remove the pits as well. A paring knife helps in both of these tasks. Bring the milk to a simmer in a pot and add the dates. Cover and remove from heat. Let the dates soak and the milk cool for 15 minutes, then add the cocoa powder and blend everything until very smooth with an immersion blender or in a regular blender. If using a regular blender, scoop the dates into the blender with the cocoa powder and only add a third of the milk, just enough to get the blender going, then mix it all back into the pot of milk. Mix in the pinch of salt, taste, and add more if desired. Bring the mixture back to a simmer. Remove from heat and add the chocolate, whisking and folding until melted and smooth. Whisk over an ice bath until cool, then chill in the fridge until ice cold. Whisk in the Kahlúa and churn in an ice cream maker. Freezing the ice cream for at least a few hours before eating yields the best consistency. If totally frozen, thaw at room temperature for 10-15 minutes before scooping. Any idea how many ounces of chopped chocolate? I’ve gotten hooked on measuring by weight vs. volume. SO in love with this recipe! I can’t wait to break out the ol’ ice cream maker this summer! This recipe will definitely be on the rotation – pinned! Thanks Alexa! 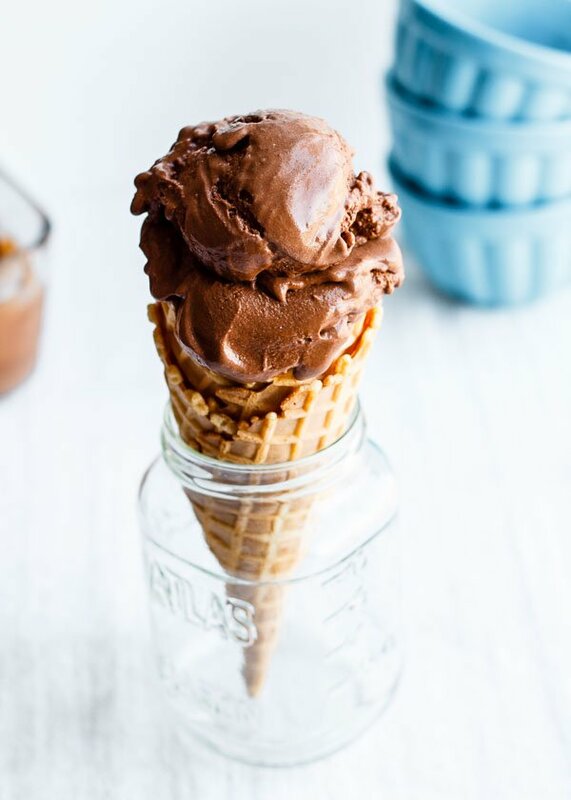 I think I’ve become addicted to my ice cream maker – best investment ever right?? 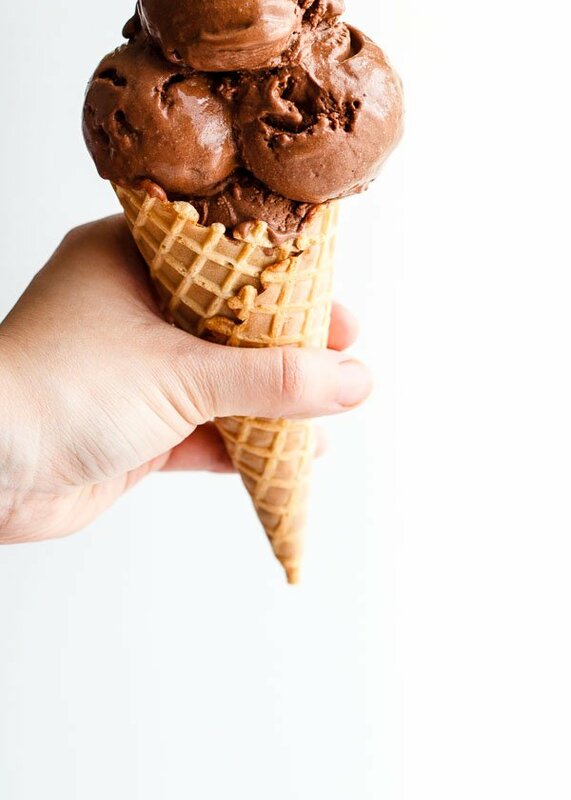 Love that cropped ice cream shot! High five for keeping it real. 🙂 Sounds and looks awesome. Can’t wait to try it! Haha thanks for liking my wonky photo Emily!